What happened to the Dyan Garris free angel card readings online? The short answer is nothing, really. 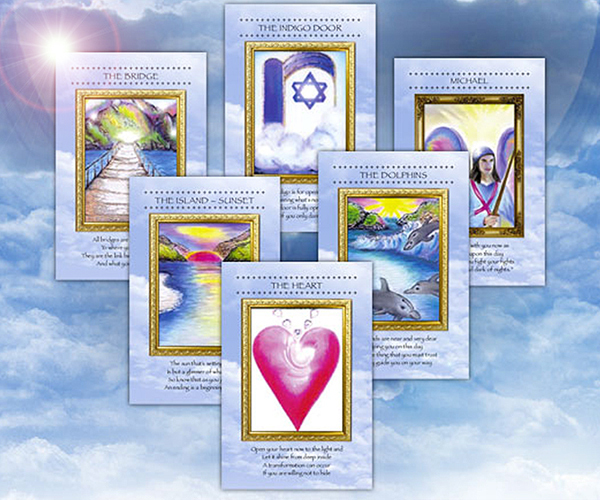 You can still get free angel card readings online with the Dyan Garris angel cards (Voice of the Angels – A Healing Journey Spiritual Cards) HERE. These free angel card readings are available in a Celtic Cross format, a three card format, and some other formats, and the good news is they all will work with your mobile device. The longer answer to “Where are did the free angel card readings go?” is that when I sold the website Voice of the Angels.com, the new owner decided not to have the free angel card readings front and center. Then it is my understanding that the site was subsequently sold again and the newest owner seems to have done away with them completely. This is also why you won’t find them on any other affiliate sites anymore either. However, since they are my cards – my copyrighted work – and because the original angel card readings were done in flash format (which does not work with your i-device), a few years ago I re-made the online free angel card readings in a format that DOES work with your mobile devices. Again, you will find these free angel card readings online with my original angel card deck HERE. Along with making new readings online for these angel cards, I also have created several new oracle decks, and made free card readings online for those also in the same place. So instead of being limited to a very old flash version, you now have many other choices for the angel card readings and they work with across all of your devices. Enjoy! Also, for a very limited time, the Dyan Garris angel card deck is available in print again because I found a small quantity of booklets the printer had sent me as overrun long, long ago, and so rather than through them out, I decided to make a special collector’s edition of this angel card deck. We have only about 50 left. When they are gone, they are gone. You can buy them here. NOTE: SOLD OUT! OUT OF PRINT. NO LONGER AVAILABLE!